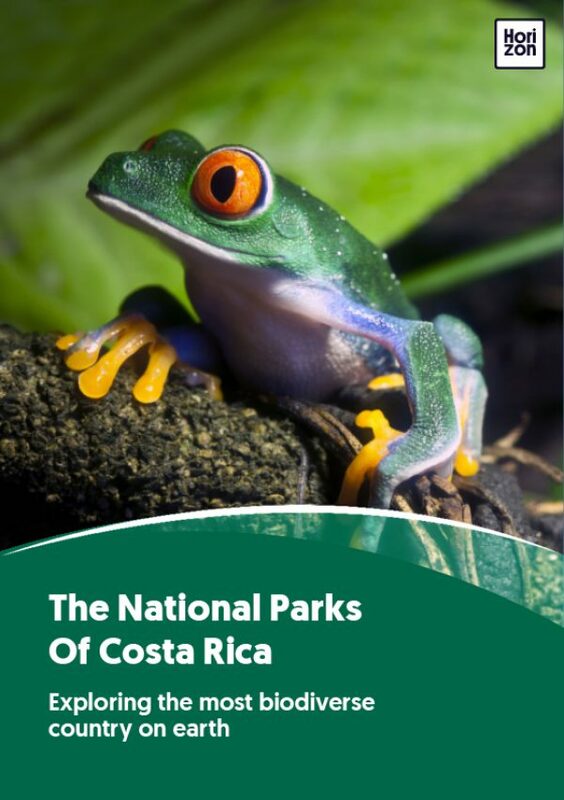 Though Costa Rica occupies just 0.03% of the world’s surface, it is home to an estimated 5% of the world’s biodiversity: 500,000+ total species, among them nearly 250 mammal species (approximately half of which are bats), around 900 migratory and resident bird species, 225+ reptiles, 175 amphibian species (85% are frogs), and 300,000+ insect species, including 1,250+ butterfly and around 8,000 species of moth. Here are the hottest spots for getting deep into it. Monteverde’s misty cloud forests offer an incredible slice of the world’s biodiversity, including approximately 5% of the planet’s total bird species. These ethereal forests are also home to 130 mammal species, 700 butterfly species, and more than 3,000 plant species, of which 29% are epiphytes and approximately 500 species are orchids. Poás Volcano National Park is the second-most visited national park in Costa Rica, in large part due to its spectacular nature: the earth’s most acidic lagoon in the world’s second-widest crater (0.9 miles wide). The park is also home to 80+ bird species, including the beloved resplendent quetzal. Tortuguero’s labyrinthine canals and turtle nesting beaches teem with life: four endangered sea turtles (loggerhead, hawksbill, leatherback and green) nest and hatch here (July-September) and 375 bird species, including many aquatic birds, reside in Tortuguero. Located at the confluence of the Continental Divide, Tenorio Volcano is home to a startling array of habitats and, therefore, wildlife. Birdwatchers find a variety of eagles, motmots, tanagers, cuckoos, and other species. The volcano itself, with its mud pots, hot springs and volcanic fissures, and the baby-blue Rio Celeste offer plenty to see. The slopes and rivers surrounding Arenal Volcano are some of the most biodiverse in Costa Rica, especially in terms of bird life--anhingas, toucans, herons and woodpeckers, among them. The area is also rich with mammals (howler and white-faced monkeys, sloths, and armadillos), reptiles (lizards, American crocodiles, caimans, and basilisks), and frogs.